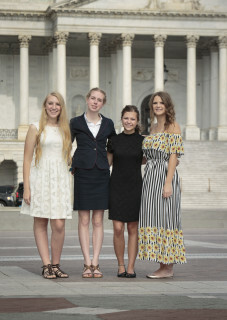 Four local high school students participating in Blue Ridge Energy’s Leadership Track program recently earned the opportunity to spend an all-expense-paid week in Washington, D.C. representing their electric cooperative on the national Washington Youth Tour. Blue Ridge Energy students joined 1,700 other students from across America for the 53rd annual Electric Cooperative Youth Tour — a leadership, travel and educational opportunity for young men and women. During the tour, students learned about American government, U.S. history and the cooperative business model. Several members of North Carolina’s congressional delegation took time to meet with the youth delegates from their districts. Alleghany County: Rylie LaRue, Alleghany High School, daughter of Coby and Emily LaRue of Sparta. Part of the trip included a competition where North Carolina participants of the Washington Youth Tour competed against one another for a $2,000 scholarship. Lenoir native, Caitlin Finley, was the winner of the competition and will represent all North Carolina cooperatives at the upcoming national competition in Washington D.C. The Blue Ridge Energy Leadership Track is a program for high school students that teaches leadership development and helps students prepare for college. The Leadership Track is free to join and more information including an application can be found at https://www.blueridgeenergy.com/community/youth-leadership-track. Blue Ridge Energy is a member owned electric cooperative serving some 75,000 members in Caldwell, Watauga, Ashe, and Alleghany counties as well as parts of Wilkes, Avery, and Alexander counties. It also includes a propane heating fuels subsidiary and business-to-business telecommunications subsidiary. To learn more about youth leadership and scholarship opportunities, visit Blue Ridge Energy’s web site at www.BlueRidgeEnergy.com under “Community” or contact your local Blue Ridge Energy office.